It’s midseason finale time on The Flash! You know what that means: an okay episode vaguely hinting at the season’s main plot arc, with a shocking final five minutes that lead into weeks of hiatus. This episode, “Don’t Run,” fits that formula to a T and leaves us with the run-up to a comics-inspired storyline that the show has been hinting at since the first season’s finale. I, for one, was just impressed by the implication that the writers actually plan stuff that far ahead. As usual, the big crossover event is largely ignored when things go back to normal. All we get as hints to the happenings of “Crisis on Earth-X” is references to Barry and Iris’s honeymoon in Bali, the newlyweds opening wedding gifts, and one line from Iris about how her wedding kinda got sidelined twice — once by alternate-Earth crossover shenanigans, and a second time by a last-second interruption by Felicity and Oliver jumping on the bandwagon for wedded bliss. 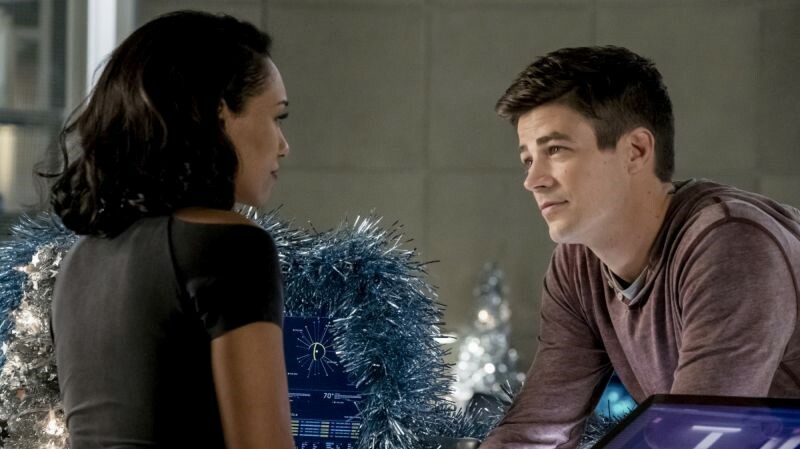 The gift unwrapping scene drops a couple foreshadowing clues: first, Barry and Iris get a fancy knife set from someone, missing one knife and with no card. Second, Iris notices that Barry isn’t speed-cleaning the wrapping debris and comments on it, and Barry replies that he doesn’t feel like he “needs” his powers anymore. He’s more at peace now and doesn’t need the speed to make all his problems disappear like he used to. It’s kind of interesting how this simple, light little scene ends up establishing two versions of the old Chekhov’s Gun dramatic principle: one that’s very direct (the knife), and another that’s more philosophical or emotional (the running). When Barry and Iris are coming back from exchanging some of their unwanted gifts at the store, they run into DeVoe (or, more accurately, The Thinker, since he’s in his fancy villain chair). The couple is separated and Barry is swiped, leaving Iris to deal with the aftermath. It wouldn’t be such a problem, if not for the fact that Caitlin gets swiped as well, by Amunet Black. So Team Flash is down two members, both kidnapped, and Iris has to get them both back. Unfortunately, Iris asks Cisco to use his Vibe powers to find Barry and Cisco gets blasted by whatever protections DeVoe has put around his new prisoner, sending Cisco out of commission. If he’d tried finding Caitlin first, he probably would have — and Iris wouldn’t have needed to tax their resources by looking for both of them or, ultimately, making the decision on who to focus on. During the kidnapping, Amunet stuck a dampening cuff on her and confirms, once they arrive at an abandoned hospital, that she doesn’t need Killer Frost — she needs Dr. Caitlin Snow. Even though I don’t think Caitlin has ever been a surgeon, Amunet expects Caitlin to perform a delicate surgery on a metahuman she shot in the head and she tells Caitlin that if she doesn’t do it, or if her patient dies, Caitlin will be killed. Caitlin’s storyline has a couple nice moments in it, though it initially seems like pointless distraction from Barry dealing with DeVoe. First off, it’s interesting that what drove Caitlin out of the lab is learning that everyone loves Killer Frost. Her friends have inside jokes with Killer Frost. Killer Frost has her own drink at Jitters. Killer Frost is cool and funny and helped fight alternate-Earth Nazis with everyone. The in-universe favoritism of Killer Frost over Caitlin Snow sounds like what The Flash fans online have been saying about favoring Killer Frost over Caitlin Snow, so I wonder if that was the inspiration for this character beat, taking Caitlin’s relationship with her alter-ego from fear to jealousy. When she’s kidnapped and the metahuman she’s meant to be operating on, Dominic, shares his story with her, he and Caitlin have some charming moments of connection, which is another little thing I liked about Caitlin’s story. Dominic’s just a regular TSA agent who got caught on that bus with all the other metas created after Barry’s exit from the Speed Force, but the power he received — the ability to read the thoughts of the people around him — is a commodity, and one that Amunet already has a buyer for. Dominic has a piece of metal wedged near the base of his skull, but he says it doesn’t hurt. I’ve watched the episode twice and I can’t figure out why he’s not in pain, or if it’s important that he’s not in pain. Still, Caitlin says that the piece of metal has to go, and that removing it might be beyond her abilities. This is where the third interesting thing in Caitlin’s plot comes along: a pep talk from the villain, of all people. Amunet shows that she does genuinely acknowledge how bright, resourceful, and resilient Caitlin is, telling her captive exactly what she needs to hear after being surrounded by Killer Frost fandom. Caitlin takes that pep talk to heart, removes the hunk of metal from Dominic’s head, and devises a plan to escape Amunet by faking a medical emergency. Also, the surgery took about five seconds, so... not as difficult as Caitlin made it out to be, I guess. Caitlin knocks the evildoers out with anesthetic, team members arrive to help in their escape, Dominic gets invited to the office Christmas party, and Caitlin feels better about herself — and she made a new friend! But wait...! Barry wakes up in the Thinker’s sanctuary, surrounded by an invisible barrier that he can’t phase through. Most of Barry’s part of the episode is spent with him listening to Thinker’s nefarious plotting, quipping at everything the guy says, and trying to figure out what, exactly, he wants. Since we got earlier scenes of Mr. and Mrs. DeVoe talking about Clifford eventually not saying things with his own voice, the audience is led to believe that DeVoe’s plan is to transfer his consciousness into Barry’s body, but Barry assumes DeVoe wants his powers. Barry, the man is in a wheelchair and speedster powers — despite what three years of supervillains might have made you think — aren’t even that cool. Inspired by something said by DeVoe’s wife, Barry learns how to make himself invisible and escape from his cell. That’s neat. DeVoe teleports them both hundreds of feet above the city, then accidentally blows up his own hover chair trying to get rid of Barry. Barry lands in the river, but is saved by the floatation device Cisco re-installed in his suit. DeVoe is lost, but of course no one believes he’s really gone forever. At the Christmas party later, Dominic shows up and gets introduced to the rest of the team. Barry gets a call telling him the alarm’s going off in his and Iris’s apartment, so he goes to check it out. Once there, he gets a phone call — from Dominic, who is actually DeVoe. It wasn’t Barry’s body he wanted to transfer his consciousness into at all, it was Dominic’s, and DeVoe was the client Amunet had lined up to buy his metahuman ability. But the most shocking thing is also the fulfillment of the Chekhov’s Gun trope set up at the beginning of the episode. Barry finds DeVoe’s old body on the floor of the apartment, stabbed with the missing knife of the mysterious set he and Iris received as a wedding gift. When he hears the police battering down his door and he gets the chance to run, Barry remembers what he told Iris, probably assumes that being on the run for murder would ruin that peace he’d developed and make him look super guilty, and he stays still instead. I adore how the only thing that can pull Harry out of his general snarkiness is giving pep talks to team members. His little chat with Caitlin was genuinely cute. Hey, Barry? DeVoe ain’t wrong about that whole “learning humility” thing. Joe calling Barry his son is still my favorite thing. •“Are you a time traveler? Because those white girl dreads came straight from the ‘90s.” Hee. Cisco. “This house is...” “Bitchin’?” Tell. Me. What. It. Meeeeans.